Verso Altima Regional Forum is one of the most important business and technology conferences in Bosnia and Herzegovina. After many years of successful organizations, Forum expands the platform of digital trends beyond borders and this year will bring together world leading ICT vendors to present the latest ICT and business solutions and trends in the digital future. The Forum will bring together nearly 250 participants from all over Europe to discuss, network and experience Digital Future 4All. 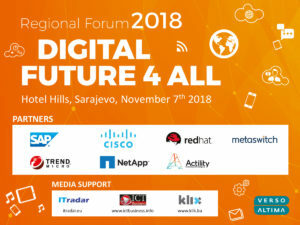 Verso Altima Regional Forum will be held in Hotel Hills in Sarajevo, November 7th 2018. Haris Ćeremida, is CEO and Co-founder of company Verso in Bosnia and Herzegovina, and has more than 15 years of experience in IT industry working for international companies in the telecom sector, including europroNET, Ericsson and Recro-net. In 2010 he started Verso office in Sarajevo, as a regional group member of Verso Altima Group. Verso is regional networking powerhouse, encompassing technological, organizational, business and commercial knowledge and expertise with the provisioning of products and services needed by companies transitioning into networked economy. Verso is strongly focused on service providers and enterprise. Krunoslav Pisačić has been part of Verso Altima Group for 11 years, and on position of Chief Software Technology Officer for last 3 years. Yet in all 18 years of his career, he has been involved in one way or another in software development and integration. He has graduated from University of Zagreb, Faculty of Electrical Engineering and Computing in 1998. His first humble programming beginnings where in Clipper/dBase and MS Access in 1990s, when he developed customer management applications and data processing tools for SOHO and public sector. With emerging of web application technologies, he continued his career as web application developer in early 2000s, making integrated database driven business application for telecommunication industry and in CRM domain. After joining Verso Altima group, in early 2010s, he experiences first big transformation projects that touched many elements of BSS Telco architecture (CRM, Billing, Provisioning). Early 2010s also mark a turning point in his career, when he is introduced to the SAP portfolio of products and TMForum frameworks, which he uses in number of implementation projects of SAP Revenue Management and CRM product lines. He also leads implementation and become product owner of several Verso Altima's products (CRM, Process Integration, and Resource Management). With his wide knowledge of industry trends, best practices and used systems and solution, he was spending majority of professional hours in role of solution architect for SAP Hybris Billing (BRIM). Later in 2010's, he is initiator of refactoring of internal software product line products to Java and Spring, and orientation of the company towards Hybris Commerce product line. In present day, he is responsible for technical departments of Development, SAP Consultancy and Business Analysis and involved in most of strategic and presales initiatives and tasks of the group. Earlier this year Larisa led an international pilot project Digital Cities, implemented in 6 countries of the Western Balkans and the UK, funded by the UK Government and implemented by the British Council. The project connected Cities of WB and UK through digital industry and aimed to strengthen policy, capacities and networks of digital industry professionals. Through her work in Bosnia and Herzegovina in the past 15 years, Larisa has led important development projects across Education, Society and Culture. Larisa was also the lead for the global pilot on Blended Learning 2004-2006, which explored on-line learning and use of digital tools for learning in remote locations prior to emergence of smartphones and full digital connectivity. Larisa is an international expert, speaker and consultant with qualifications from Cambridge University, UK and Auckland University in New Zealand in the area of Adult Education, Linguistics and Psychology, with 20 years of experience in leadership and management. Alexandru Jijian is an SAP Customer Experience consultant with more than 15 years of experience. He is currently the SAP CX Solution Engineering Team Leader for the Central & Eastern Europe region. Having a wide variety of projects in his portfolio, from bootstrapped start-ups to large, corporate projects spanning complex B2B, Telco or B2C scenarios like Auchan Romania or Bridgestone Turkey, Alexandru focuses on keeping companies closer to their customers. He’s an active part of the regional CX Community, regularly transferring knowledge through trainings related to User and Customer Experience, Project Management, Business Analysis, Integrated Marketing, Sales and Logistics. He’s also the biggest Omni channel fan you’ll meet at this conference. Come and say hi, he’s got answers to your Customer Experience questions! Žiga Benedik is responsible for developing Trend Micro's business for the Adriatic region, Albania and Bulgaria. He has been active in the IT industry for 10 years, and his professional experience includes several technology and sales positions in IT organizations. covering LAN, desktop protocols and ATM technologies. In March 2000. he moved to Cisco Systems in Zagreb working as presales system engineer covering small, medium, enterprise, service provider and mobile type of customers. Milan Vasilevski joined NetApp as a Partner Account Manager for Adriatic and Hungary in November 2016 and is responsible for building and developing the partner network in the region. In his current role Milan is driving the growth of NetApp and it’s channel partners in more than 8 countries. He also focuses on business development with leading NetApp alliance and technology partners, to successfully help customers navigate the next wave of digital transformation. Milan has more than eight years of proven track record in the IT industry. Prior to joining NetApp, he worked at one of the largest system integration companies in the region of South Eastern Europe. Graduating from ISEP Engineering School in 2004, he brings 12-years experience in Project Management and Open Source platform development. He joined Actility as a Project Manager, with a smile on his face from day 1 and just keeps rocking along! Jurij Bertok holds a Master Degree in Electrical Engineering from the Faculty of Electrical Engineering, University of Ljubljana. He started his career at the faculty where he worked as a researcher in the Laboratory for Communication Devices at the Department of Telecommunication. In 1991 he joined the Ministry of Defense where he held several positions. From 2000 to 2005 he was the head of the IT and Communications Sector, and in 2005 appointed as CIO to lead the IT operations for the Ministry of Defense. As of January 2013, Jurij Bertok is the Director-General of IT Directorate at the Ministry of Public Administration, the main coordination institution for the development and implementation of eGovernment in Slovenia. Branislav Bukva is specializing on Red Hat courses and certification portfolio in Eastern Europe. He is helping Red Hat Customers & Partners to get the latest Red Hat technology skills at the right time, place and modality, therefore significantly improve return on investment. He active speaker and seeking constantly improving his sales and communication skills. As passionate artist he likes to escape digital world by creating abstract art. Vincent is experienced Sales and Technical professional with more than 30 years of experience promoting and selling into various industry sectors including carriers, major enterprises and government organizations. He started his carrier in the protocol analysis area as Product Manager then Sales Manager. This gave him a strong technical expertise on SS7, SIP and protocols in general. Vincent was then taking different position from Technical Director to EMEA Sales Director, managing Sales and Pre-Sales engineers. He spent 10 years at Network Equipment technologies, N.E.T., then 6 years at COMVERSE, to finally started in 2011 at Metaswitch. His areas of expertise went then to IMS, LTE, 3GPP and Diameter. For Metaswitch, Vincent started to promote their solutions in Europe to grow their install base after the company became #1 of Class 5 services in USA. As Metaswitch is a well-recognized leader in Cloud Native technologies, it added to Vincent’s expertise Virtualization and signaling/data plane separation up to 5G slicing. Vincent is a very efficient Sales Director with a proven record of successful project deployment success from Tier2/3 to tier 1 as diverse as: Orange, A1 Group, NOS, Wind3, Blicnet, IPKO and HT Mostar. John is Director of Marketing with responsibility for defining and executing the market strategy across the entire Metaswitch portfolio. He is based in London and brings 20 years of industry experience specialising in voice outsourcing and business process transformation. John joined Metaswitch from Colt Technology Services where he led the voice trading and commercial operations teams and during his time there implemented a deal that saw Colt outsource its retail international outbound traffic. Prior to joining Colt John spent 10 years at Tata Communications, the latter half as Commercial Director in the Outsource and Consulting division working with Tier 1 operators on business transformation. John holds a BA in European Business Studies from the Nottingham Business School and, when he isn’t looking after his three young children, likes to hit a tennis ball, golf ball, squash ball or anything round that needs hitting.